2. Take something that doesn’t require frames or lots of extras, like charts and so forth. 3. Take something that requires simple stitching rather than complicated. 4. Take something that doesn’t require perfect lighting. So with those main points in mind, I set about deciding what I would take, and it boiled down to a felt project. Embroidery on felt – at least the kind I do – is generally simple: no frames or hoops, no charts, small and able to be worked in-hand, simple stitches, and bold rather than fine stitching. 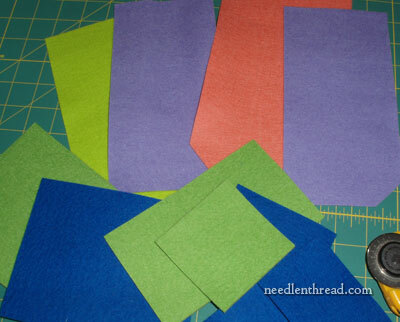 I cut a few pieces of felt 5″ x 9″ – a good size for a three-fold piece, where the final fold works as a flap. 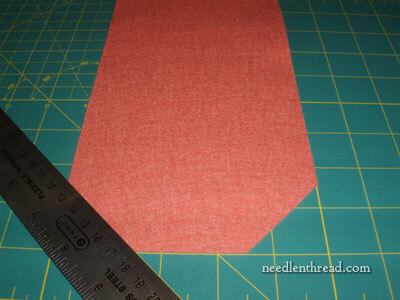 I lopped off the corners on one of the short sides. This can fold up into a little pouch. 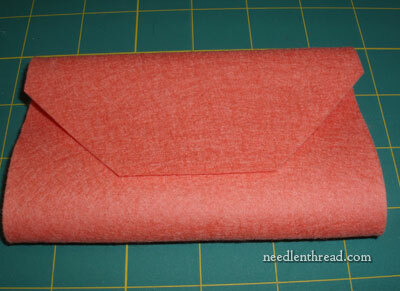 I’ll stitch the outside of the pouch and then line the inside, sew the sides up, and put a button on it. 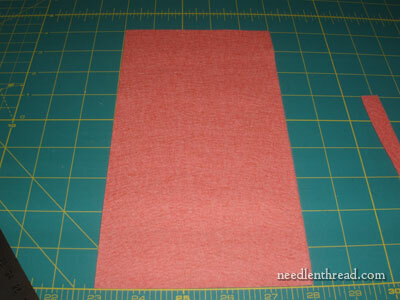 I also cut out some squares of 3 mm felt, which is pretty thick. I have an idea for these, and maybe the Road Trip will see the idea part way realized if I can do some stitching on them. They’re small and stiff. After cutting out the felt, I sorted through threads. Pressed for time, I couldn’t sit there and color match everything and plan out what I wanted to use. Besides, I like “random” stitching on felt. So I ended up packing too many threads into a zipper mesh bag, along with the felt pieces, needles, and a pair of scissors. And there’s my Road Tripping Stitching Kit! I’ll let you know if I use it! Well, whatever you decide to do, I hope you have a refreshing break. You work so hard here, offering your advice on so many things and letting us share in what you are doing ….. oh, and fitting in being a teacher! I look forward to seeing how the felt inspires you. I love holidays myself as I always take some sewing with me and always manage to get much more done than I normally do. What a fabulous idea! Oh my heavens. I think I know what MY new project will be! Have a safe and happy trip! Yes, you have it in a nut shell alright Mary. 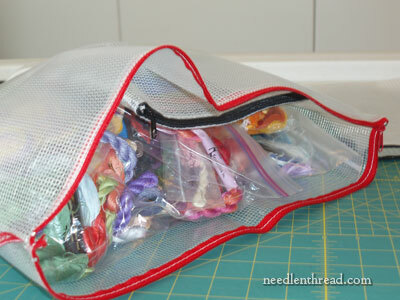 Even tho I can’t stitch in the car, you’ve done the good thinking for me for a just in case project bag. I love what you did with the cover before. It was ‘my time’ but I’ve looked it all up since Monday’s post. The idea of the folded pocket appeals too. I like that orangey colour. Looking forward to seeing it sometime. Colours, stitches, design etc, whether you stitch on this trip or later. And the thick squares too. Someone mentioned ginger for carsickness. Yes, I find it very helpful. Also Dry Ginger Ale. They say the driver doesn’t get sick because driving tricks the brain (inner ear part). Apparently you get sick because although you are moving along you are also sitting still and your brain gets muddled (or whatever). The driver is looking down at the speedo regularly (a stationary object) and your brain is able to work out you are actually sitting still and there is no problem. It should work for the passenger to regularly glance down at the glove box. I usually don’t think of that until I start to feel off. Sorry Mary, probably common knowlege. Happy for you to scrap it. Oh, it has just occured to me that it might work the other way around. Looking at your embroidery most of the time and only taking a quick look up. Any takers to try it out? Me?! Err..I’ve just remembered a phone call I have to make, or is that someone at the door? See ya. It looks like fun! Have a good trip, will you be taking a laptop and posting occasionally while on the road? I hope so. Kath, what great advice about motion-sickness. I always wondered why the driver never experiences it. Thanks! Enjoy your break. 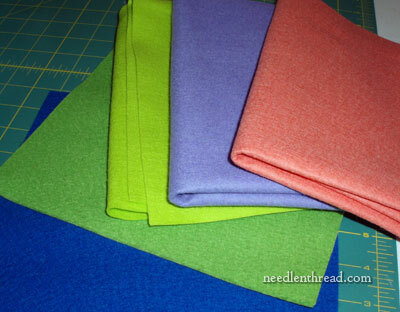 You have some nice felt all ready to stitch. So if any stitching is possible, I am sure it will be very interesting for all of us. That looks neat and really waiting to see the result.. Whether you stitch or not doesn’t matter.. But make sure you enjoy your road trip and Have a fantastic vacation..
Oh, Mary, I was hoping you would choose the felt! I love the needle book you created with the red felt and your imagination on some other excursion – and it looks like you had fun doing it. We’ll miss you while you’re gone, but look forward to reading your guests’ posts. Happy travels and happy stitching! I’m about to go on a 3 day drive, and I didn’t even think to bring my embroidery with me! Previous Previous post: Needlework on the Road? Next Next post: Upcoming Needlework Topics on Needle ‘n Thread!